Something incredible has just been spotted deep in the outer reaches of space by NASA's Hubble Telescope using an amazing method. 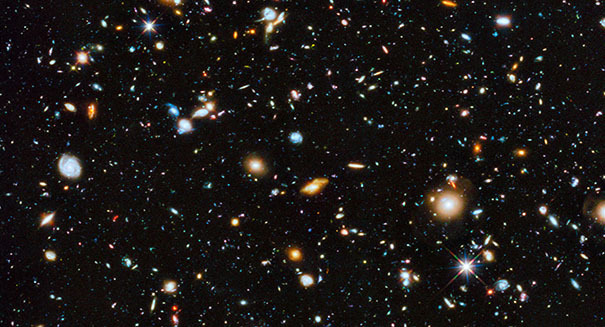 Scientists have just made a totally amazing discovery deep in space using NASA’s Hubble Space Telescope, and they used a clever trick to do it. Using the “natural magnifying glass” of a galaxy cluster, they were able to produce an image of an incredibly distant galaxy that is 10 times sharper than they normally would have, enabling them to find something that could totally change how we understand star-forming regions from shortly after the Big Bang. Scientists took images of a galaxy that formed only 2.7 billion years following the Big Bang, and found that it was just 200 to 300 light years across. Experts believed that such star-forming knots were 3,000 light years across, but this finding throws that theory into question. Hubble used a gravitational lense, or a much closer massive object like a cluster of galaxies, to magnifying an image that is warped into an arc shape around that cluster. That allows us to see something far, far away that even the Hubble telescope wouldn’t be able to pick up otherwise. And it’s leading to exciting discoveries like this one.